Summer is almost here! Fourth of July…picnics with family & friends…long, lazy days spent lounging around…and National Forklift Safety Day. When it seems like everything and everyone gets a holiday nowadays, it shouldn’t be surprising that a National Forklift Safety Day exists. But there’s a reason behind this day – thousands of reasons, in fact. According to OSHA, there are dozens of fatalities involving forklifts every year in the U.S. Plus, tens of thousands of accidents are reported annually. The 2018 edition marks the fifth anniversary of the notable safety recognition event, to be held on June 12th. Brian Feehan, the President of Industrial Truck Association, said the event is an important milestone where people from all walks of life – workers, manufacturers, safety supervisors, and more –learn and collaborate about forklift safety issues. National Forklift Safety Day brings together legislators, safety experts, manufacturing representatives, and other forklift industry luminaries with one common goal: to raise awareness about forklift safety. The event has grown since it began in 2014. Organizers expect National Forklift Safety Day to become even bigger in the future. What can your organization do to mark this important safety event? Hold internal safety seminars. This is a great chance to explain safety hazards, review workplace safety protocols, and stress the importance of OSHA compliance. Highlight forklift maintenance. Have your forklift maintenance staff show other employees the different safety checks that go into a thorough, well-defined maintenance program. Forklift safety starts with a sensible maintenance schedule – so what better time to highlight this than during National Forklift Safety Day? Check your renewal certification. June 12th is the perfect time to make sure all of your co-workers and other forklift employees have their OSHA credentials. If not, it’s time to schedule renewal training. At CertifyMe.net, our 3-year renewal training is free for all of our customers! Eliminate safety hazards. That blind corner in your warehouse. A slippery ramp. A dimly lit aisle. On National Forklift Safety Day, take concrete action to make meaningful change in your workplace. Have everyone take a survey on which potential safety issues should be addresses – then fix them! Review your hazardous load policies. Hazardous loads are responsible for many accidents every day. Make sure your company knows exactly what makes us a hazardous load – and the most effective ways to safely and efficiently transport them. Here are three forklift safety tips to keep in mind – before, during, and after National Forklift Safety Day! Brake slowly. 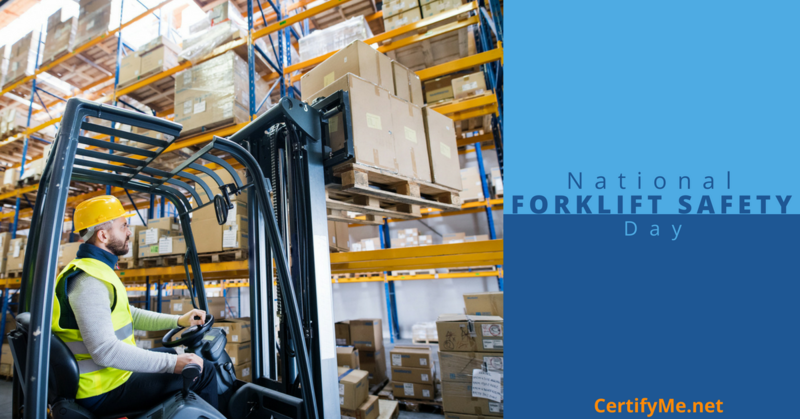 If you jam your forklift’s brakes too hard, imbalanced loads can become falling hazards. Plus, using a measured, even braking motion will allow your brakes to last longer. Watch out for blind spots. Blind spots are named that way for a reason – they’re literally “hidden hazards” that aren’t recognized until it’s too late. Keep a reasonable speed at all intersections, areas with foot traffic, aisle corners, and other potential blind spots. Keep your workspace clean. We’ve already recognized the importance of a clean warehouse. But that principle applies to any type of work area with forklifts. Construction sites, docks, lumber yards, and more – regardless of your environment, try to keep your areas as clean and debris-free as possible. Sign Up with CertifyMe.net, Where Every Day is Forklift Safety Day! CertifyMe.net has six different OSHA safety training courses for anyone looking to operate a forklift. We have custom courses for indoor lifts, heavy terrain forklifts, pallet jacks, and more. What’s more, you’ll also enjoy free 3-year renewal training. To learn more about our courses, check out our training kits here. You can also call our OSHA forklift safety experts directly at 1-888-699-4800. Thanks for stopping by our blog. What activities does your company have planned for National Forklift Safety Day? Drop CertifyMe.net a line and let us know!